This is not a new part, just a very nice part. 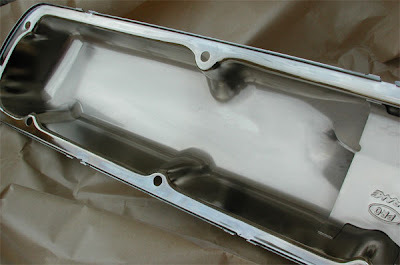 It is the exact reproduction of the original 65-66 289 High Performance Valve Cover Set. 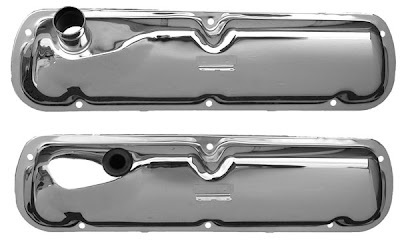 These covers were just like the original painted 289 valve covers, but were chrome plated. 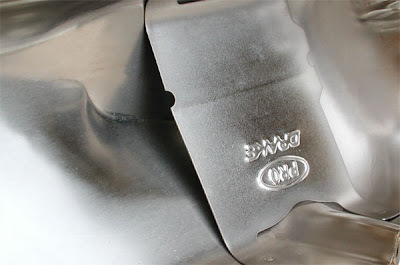 They were also available as an over-the-counter option or part of an engine dress up kit. The stamping and plating on these valve covers are just really super. 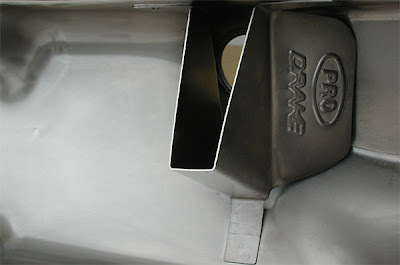 They also feature the correct baffles on the underside. 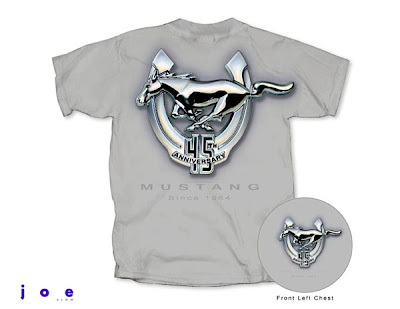 The chrome ones are part number EG328. We also have the Blue Painted set is EG431A and the Gold Painted set is EG431B. 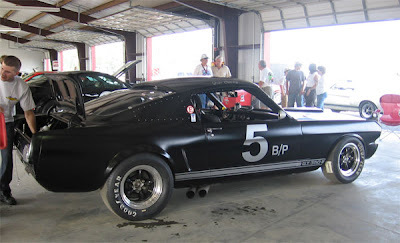 Here are some more of Joe Boland's pictures from the Shelby American Automobile Club Convention last month. See last Friday's post for Part 1. 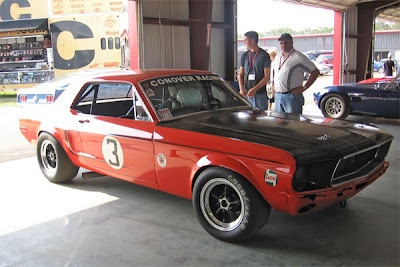 This is Tony Conover's '68 Trans-Am Mustang. 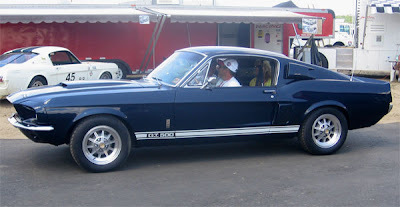 Tony is a long-time customer and real "Shelby Guy." 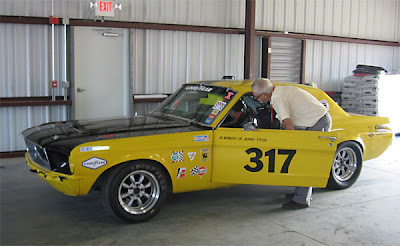 He is also owner of Conover's Racing and Restoration. 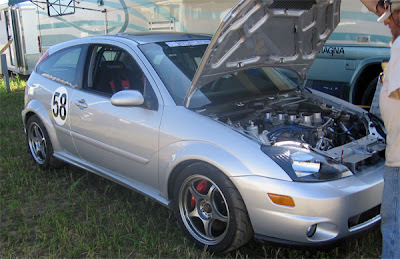 Not a Mustang, but we could not resist posting these pictures of this Focus (yes, Focus) with a stroker motor and fuel injection. 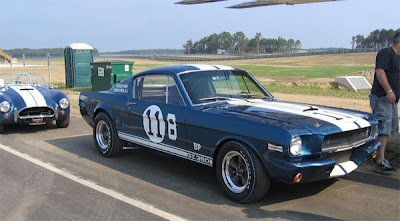 Ok, maybe this post is a little bit away from direct Mustang content, but it's still kind of cool. 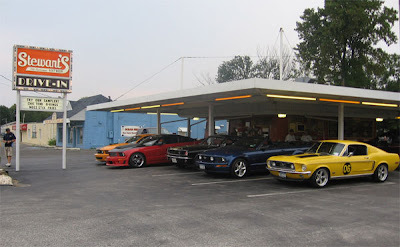 My Granddad was the parts manager at a Ford Dealership for over 40 years. Here's just one of the items I got from his small collection of trinkets. 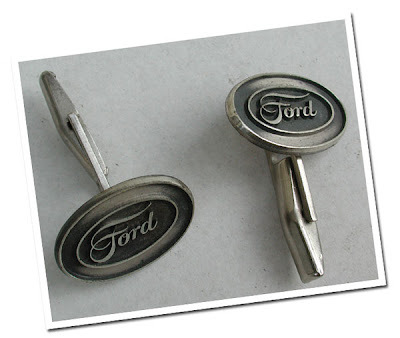 This is a set of Ford cuff links. It was part of an award that he received in 1960. 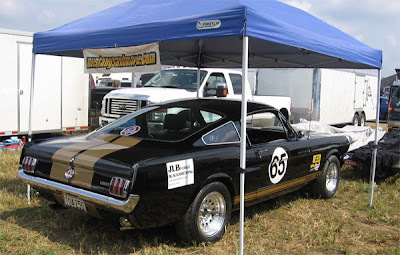 Our good friend, Joe Boland, stopped by and gave us a CD with a few pictures from the Shelby American Automobile Club Convention that was held last month at Thunderbolt Raceway in New Jersey. 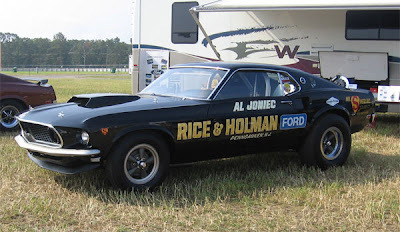 We also enjoy talking to Joe, because he truly enjoys his Mustang. He always drives it to the shop when he visits. The car sounds great, so we always hear him before we see him! 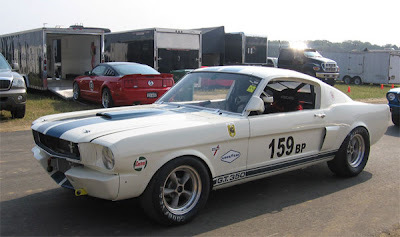 Another one of our long-time customers, Peter Crosby, just purchased one of these cool Miller Cup Mustangs. 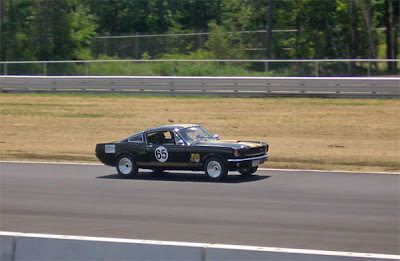 Joe with his '65 Mustang GT350H "clone" on the track. 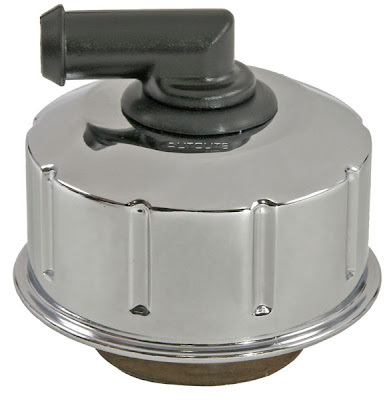 From time to time, we like to post a quick entry about a unique part that we have available. 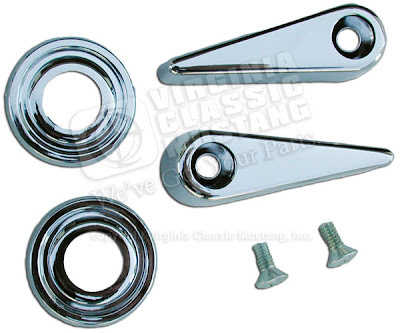 Today, we are posting abount the Front Crossmember Bolt Set. 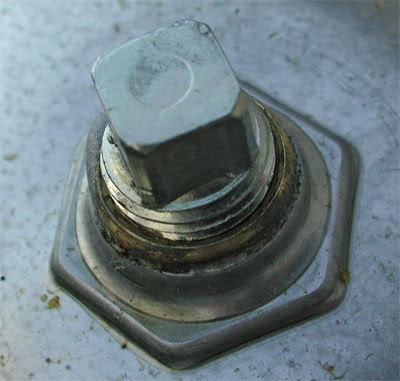 These are the bolts that hold the crossmember located under the oil pan. These are quite unique items. 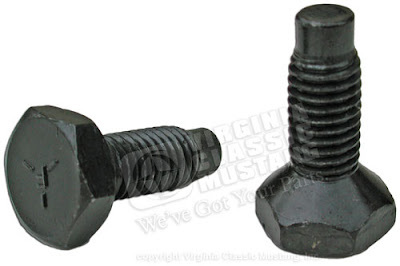 They are definitely something that cannot be found locally as "generic" replacement bolts. 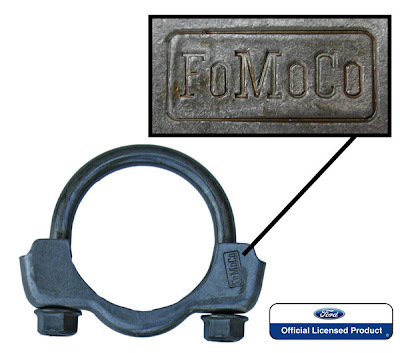 These bolts fit 1965-70 model Mustangs and probably many other Fords. 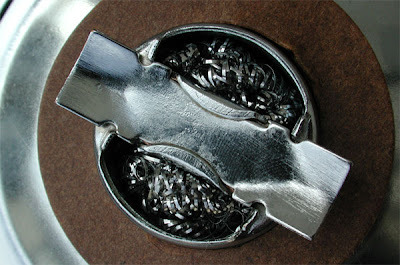 Here is another Blog entry by our friend, Troy Kruger at Custom Show Boards. Be sure to check out his web site to view his great work. Opting to go with a custom interior color combination 15 years ago, the carpet in my ’66 convertible always sort of bothered me. I still enjoyed the car with the wrong carpet style until I finally decided a change was in order. I wanted the absolute best quality I could find, but my carpet color would have to be a non-original offering for ’66 to suit my taste. That’s where Brant at VA Classic Mustang came to help. I had researched that “mass backed” carpeting was the best way to go, but Brant didn’t stock it so I had to place a custom order to get what I wanted. This also insured that my new carpeted floor mats and kick panel carpeting would match perfectly (and it did). Brant sent me various color samples until we found the one that would work. My carpeting arrived quickly and at a price I felt was a terrific value. The extra bulk and weight of the mass backed carpet was immediately evident. I unpacked it on the morning of installation and laid it out in the sun so that it would be easier to work with once it was ready for installation. It didn’t take much to prepare this carpeting, as it stayed in its correctly molded contour easily enough. This was my first time attempting to install carpet, so I gave myself an entire day. I certainly needed the entire day for this project. So out went the seats, full center console and old carpeting ( I can honestly say that removing the console without injuring anything was the hardest part of the whole job). A previous owner glued down a thick rubber style underlayment that I chose not to disturb since it still looked good and appeared to be doing the job. That thick underlayment, combined with the extra bulk of the Mass Backed carpeting did not allow my console to go back in without butchering the new carpet (and my knuckles), so I decided not to reinstall it. The rear section went in great without the need for any trimming. The front had a little hole sliced out for the shifter, which I had to enlarge to make work around the reverse lockout on the 4-speed shifter. I was careful to make sure I didn’t cut too big or the small little chrome boot retainer wouldn’t cover up the hole correctly. The front carpet laid into place easily and starting from the center hump outward, I carefully planned for some trimming by the door sill area. Measure twice, cut once is the advice I’ve always heard. I used a large scissor type tool to trim the carpet while it was in place, and this worked very well. This trimming with the scissors could be done as the very last step after the holes are all found, and seats installed. I opted not to use any spray adhesive, as I was concerned about locating and poking various holes for the seats and seat belt areas. This would have been impossible through this thick carpeting if it had all been glued into place. Finding and poking all the holes with various screw drivers and awls in place was a challenge without any help, but it eventually was done. With the seats, belts, sill trim and kick panels in place, I really don’t see a need for the adhesive with this good of a mass backed mold. As I look back on the installation, I have pride in knowing I did it all myself and I didn’t damage anything in the process. The car looks great, and has a factory look. It matches my dash pad perfectly and is exactly what I needed it to be. 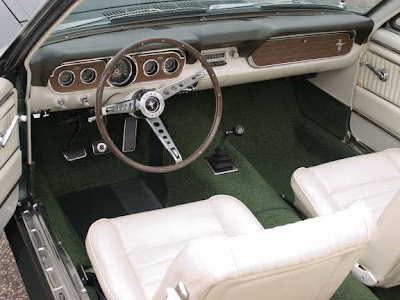 If you are considering installing new carpet in your Mustang, don’t hesitate to call the folks at VA Classic Mustang to take care of you. While you are at it, pony up and get the mass backed option, which is only available via special order. It will make the installation go much easier. 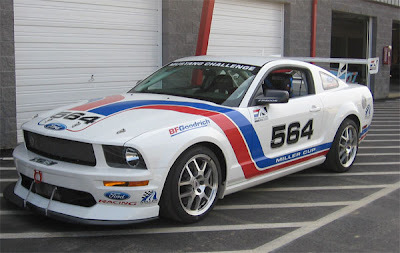 NOTE: If you wish to order the "mass backed" carpet for your Mustang, it is available by special order only for an additional $60.00. This option is not listed on our web site and is available only by calling us at 540-896-2695. 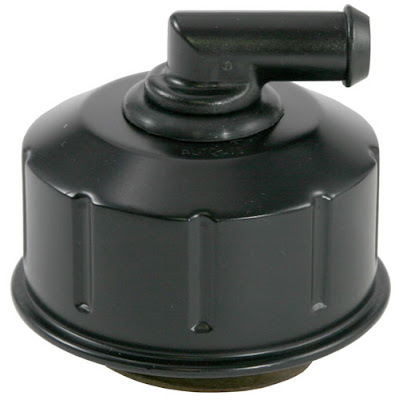 This is a part that we currently have listed in our 2008 print catalog, and a new version of the part that is not listed. 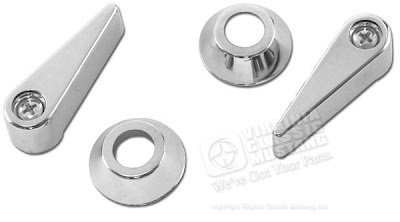 These chrome front seat side latch handles are usually pitted or missing. 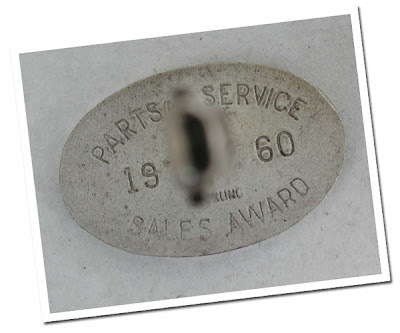 The version for the '68-69 model is incorrectly listed in our printed catalog as '68-70. 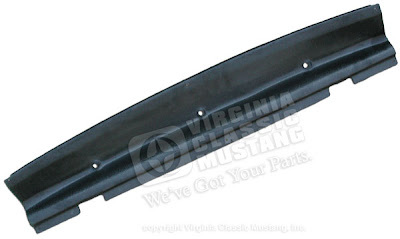 We also now have a brand new version for the '70-73 model Mustang. Note in the pictures that the difference between the models is the design of the bezel that fits behind the handle. 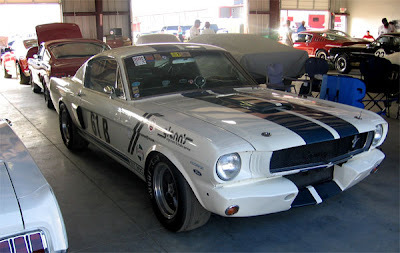 Order part number ST751 for '68-69 models and ST7511 for '70-73 models. I hesitated when thinking about posting this. 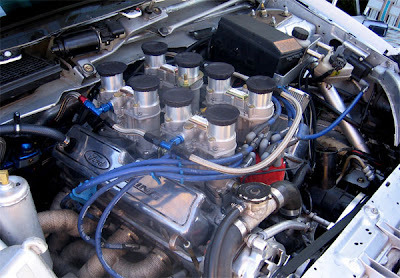 I know, I know, it's not a Ford engine. 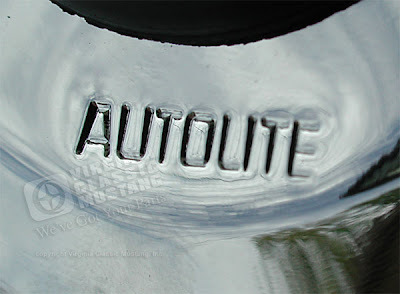 If you are a true car guy (or gal) though, it really doesn't matter. This is just really cool. I had no idea that there was a hobby that involved building running, miniature engines. This guy is obviously extremely talented. Check out the web site and video. Two new items just arrived. 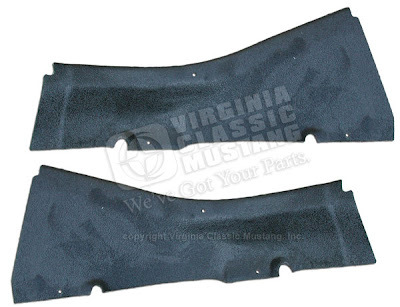 These are both interior trim pieces for the rear of a fastback. The first part is sold as a pair. These are the trim pieces that fit at the bottom corners of the rear window. The other is the panel that fits under the rear window and above the trap door. Both are vacuum formed plastic with a fine grain that you can see in the pictures. 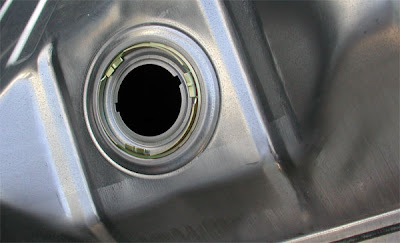 We still have rear trap doors, various 67-68 rear fastback interior pieces, 69-70 pieces, and related parts and fasteners.